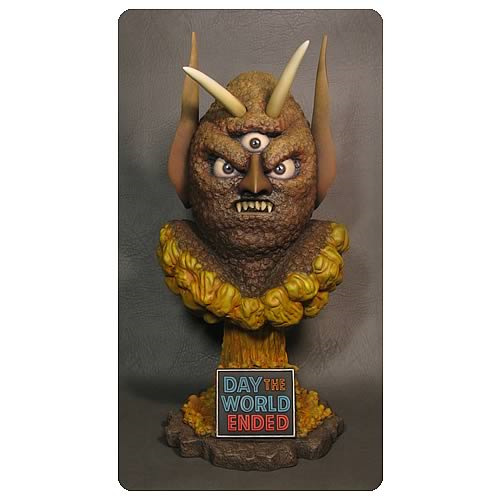 Make room in your B-movie monster collection for this Day the World Ended Marty Three Eyed Mutant Bust! Looks just like monster maker Paul Blaisdell's B-movie creation. Limited edition of 250 pieces! When famous monster maker Paul Blaisdell wore the costume of this radiation-riddled creature in the 1955 B-movie classic Day the World Ended he never could have envisioned it would inspire this amazing Day the World Ended Marty Three Eyed Mutant Bust! While the post-nuclear, Roger Corman-directed classic from the 1950s is beloved by many for the sheer amount of overwhelming destruction that takes place in its 80 minutes of running time, the one thing any viewer can take away from the movie is that Marty the Three Eyed Mutant is one badass creature! From his gnarly teeth to his intense three-eyed gaze, Marty makes for one unique B-movie monster, and at around 16-inches tall, he makes for one unique bust, too. If you're a B-movie fan, you'll want to get the Day the World Ended Marty Three Eyed Mutant Bust to add to your collection. Think about how cool he'll look next to your TV on B-Movie Night! Limited edition of 250 pieces. Ages 14 and up.